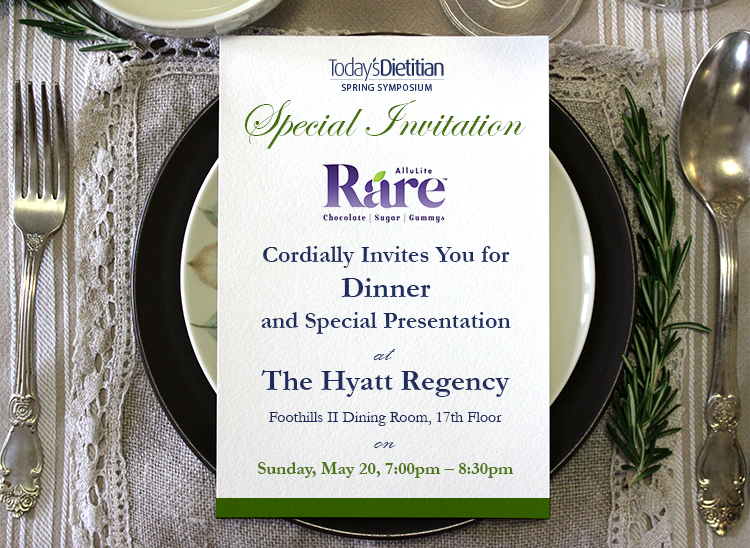 AlluLite Rare requests the pleasure of your company at an exclusive plated dinner on Sunday evening, May 20, at 7:00 PM. Enjoy delicious food and spectacular views of Austin from the top of the Hyatt Regency. AlluLite Rare CEO, Gerry Morrison, will greet the group and lead an engaging discussion about what may be the greatest breakthrough ingredient of this century: allulose. The origins of this rare sugar in nature, the science leading to its mass production, and the clinical research on its benefits will be shared. The mission of AlluLite Rare is to provide delicious options for the diabetic, obese, or health-conscious, and the rare sugar allulose is a key ingredient to satisfying society's cravings for sweet flavor, without requiring a change in behavior. For any questions, please email symposium@gvpub.com or call 877-925-2355.